fplot(f) plots symbolic input f over the default interval [-5 5]. fplot(f,[xmin xmax]) plots f over the interval [xmin xmax]. fplot(xt,yt) plots xt = x(t) and yt = y(t) over the default range of t, which is [–5 5]. fplot(xt,yt,[tmin tmax]) plots xt = x(t) and yt = y(t) over the specified range [tmin tmax]. fplot(___,LineSpec) uses LineSpec to set the line style, marker symbol, and line color. fplot(___,Name,Value) specifies line properties using one or more Name,Value pair arguments. Use this option with any of the input argument combinations in the previous syntaxes. Name,Value pair settings apply to all the lines plotted. To set options for individual lines, use the objects returned by fplot. fplot(ax,___) plots into the axes specified by ax instead of the current axes gca. fp = fplot(___) returns a function line object or parameterized line object, depending on the type of plot. Use the object to query and modify properties of a specific line. For details, see FunctionLine Properties and ParameterizedFunctionLine Properties. 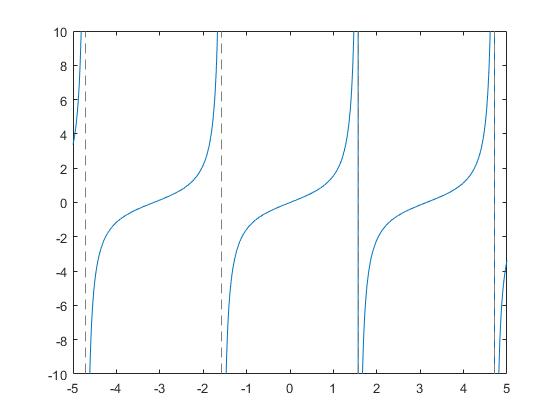 Plot tan(x) over the default range of [-5 5]. fplot shows poles by default. For details, see the ShowPoles argument in Name-Value Pair Arguments. 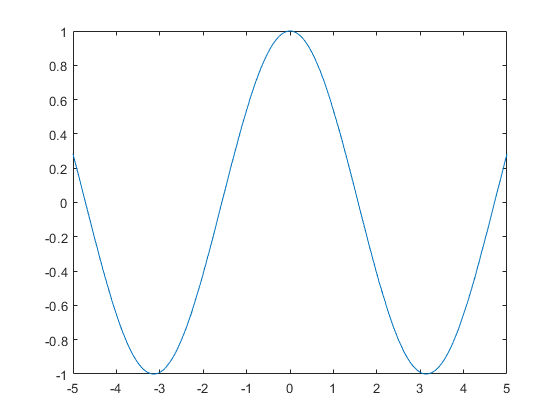 Plot the symbolic function f(x)=cos(x) over the default range [-5 5]. Plot the parametric curve x=cos(3t) and y=sin(2t). 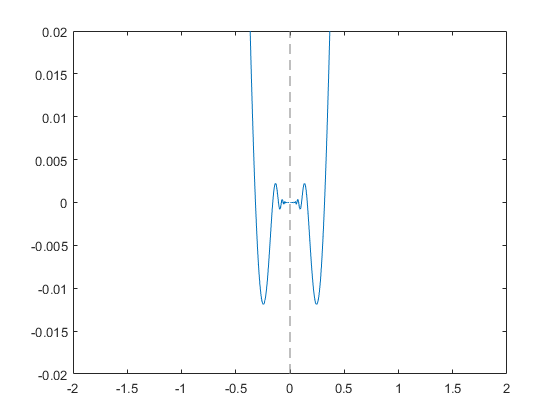 Plot sin(x) over [-π/2,π/2] by specifying the plotting interval as the second input to fplot. 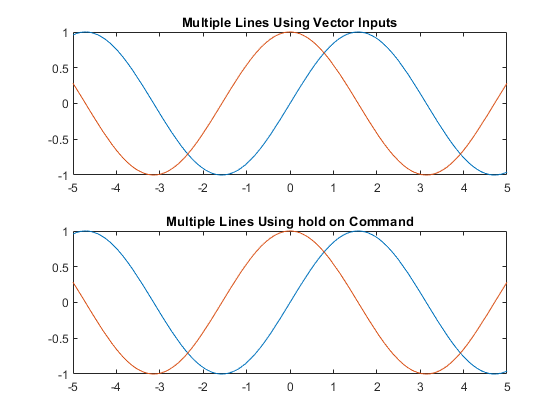 You can plot multiple lines either by passing the inputs as a vector or by using hold on to successively plot on the same figure. If you specify LineSpec and Name-Value arguments, they apply to all lines. To set options for individual plots, use the function handles returned by fplot. Divide a figure into two subplots using subplot. On the first subplot, plot sin(x) and cos(x) using vector input. 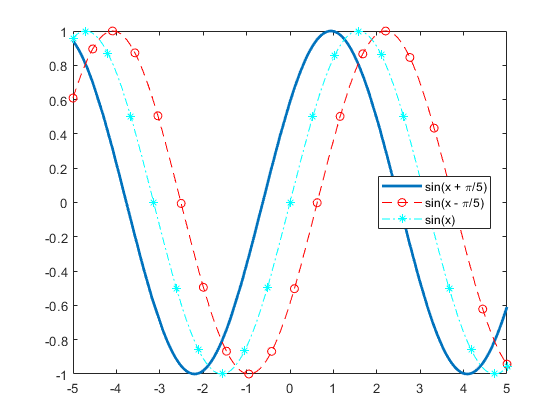 On the second subplot, plot sin(x) and cos(x) using hold on. 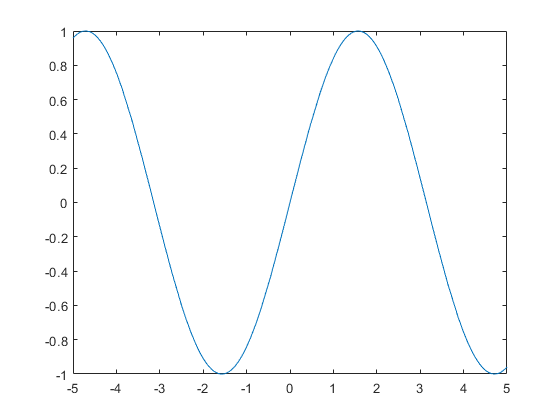 Plot three sine curves with a phase shift between each line. For the first line, use a linewidth of 2. For the second, specify a dashed red line style with circle markers. For the third, specify a cyan, dash-dot line style with asterisk markers. Display the legend. 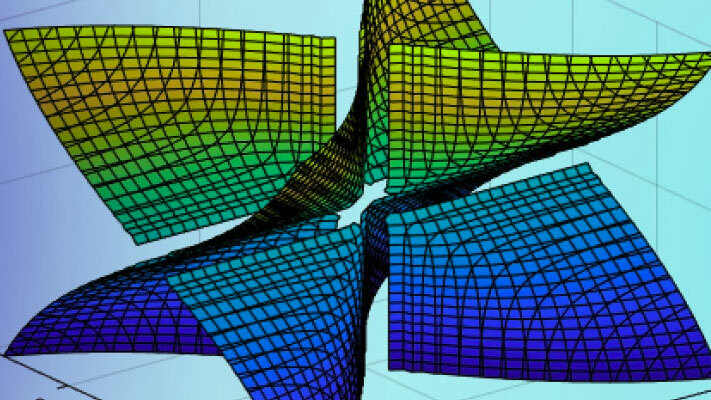 Control the resolution of a plot by using the MeshDensity option. Increasing MeshDensity can make smoother, more accurate plots, while decreasing it can increase plotting speed. Divide a figure into two by using subplot. In the first subplot, plot a step function from x = 2.1 to x = 2.15. 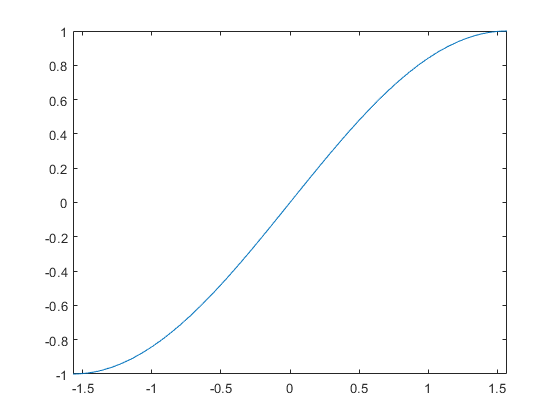 The plot's resolution is too low to detect the step function. Fix this issue by increasing MeshDensity to 39 in the second subplot. 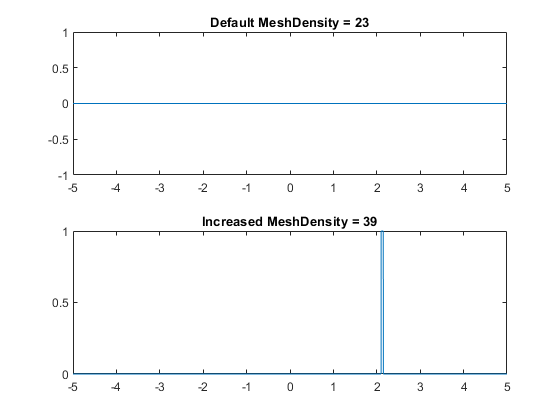 The plot now detects the step function and shows that by increasing MeshDensity you increased the plot's resolution. 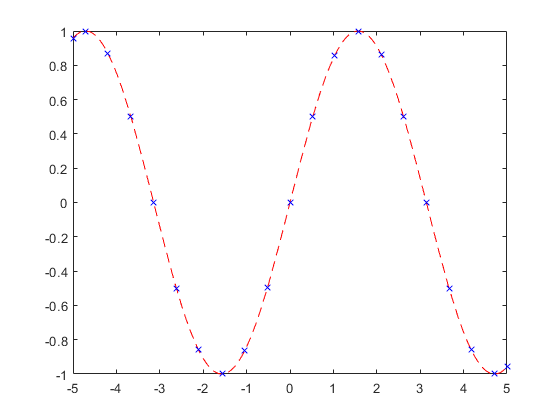 Plot sin(x). Specify an output to make fplot return the plot object. Change the default blue line to a dashed red line by using dot notation to set properties. Similarly, add 'x' markers and set the marker color to blue. 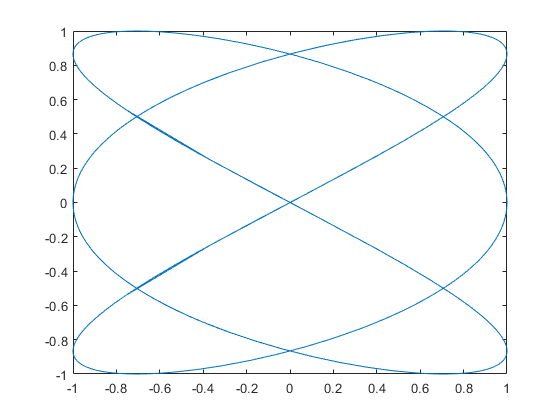 For x from -2π to 2π, plot sin(x). Add a title and axis labels. Create the x-axis ticks by spanning the x-axis limits at intervals of pi/2. Display these ticks by using the XTick property. Create x-axis labels by using arrayfun to apply texlabel to S. Display these labels by using the XTickLabel property. To use LaTeX in plots, see latex. When you zoom into a plot, fplot re-evaluates the plot automatically. This re-evaluation on zoom reveals hidden detail at smaller scales. 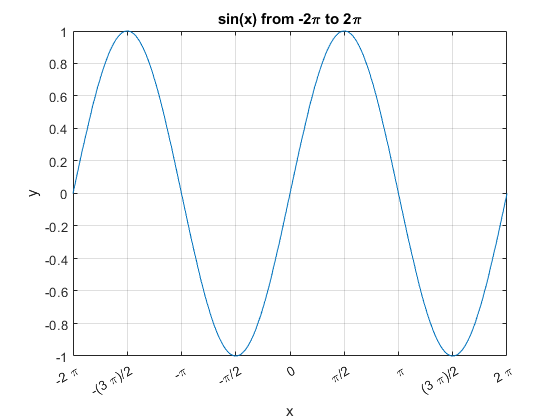 Plot x^3*sin(1/x) for -2 < x < 2 and -0.02 < y < 0.02. 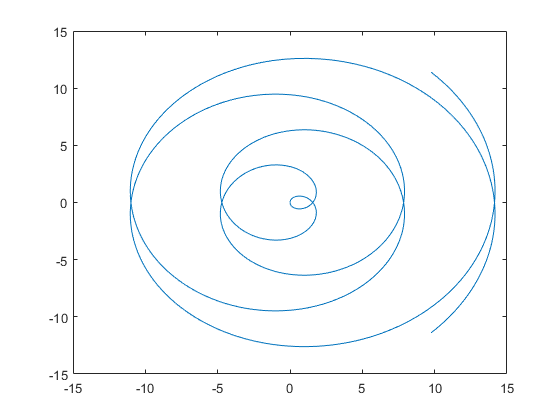 Zoom in on the plot using zoom and redraw the plot using drawnow. Because of re-evaluation on zoom, fplot reveals smaller-scale detail. Repeat the zoom 6 times to view smaller-scale details. To play the animation, click the image. Create animations by changing the displayed expression using the Function, XFunction, and YFunction properties and then by using drawnow to update the plot. To export to GIF, see imwrite. To play the animation, click the image. Expression or function to plot, specified as a symbolic expression or function. Plotting interval for x-coordinates, specified as a vector of two numbers. The default range is [-5 5]. However, if fplot detects a finite number of discontinuities in f, then fplot expands the range to show them. Parametric input for x-coordinates, specified as a symbolic expression or function. fplot uses symvar to find the parameter. Parametric input for y-axis, specified as a symbolic expression or function. fplot uses symvar to find the parameter. Range of values of parameter t, specified as a vector of two numbers. The default range is [-5 5]. Axes object. If you do not specify an axes object, then fplot uses the current axes gca. Line specification, specified as a character vector or string with a line style, marker, and color. The elements can appear in any order, and you can omit one or more options. To show only markers with no connecting lines, specify a marker and omit the line style. The function line properties listed here are only a subset. For a complete list, see FunctionLine Properties. Number of evaluation points, specified as a number. The default is 23. Because fplot uses adaptive evaluation, the actual number of evaluation points is greater. Display asymptotes at poles, specified as 'on' (default) or 'off'. The asymptotes display as gray, dashed vertical lines. fplot displays asymptotes only with the fplot(f) syntax or variants, and not with the fplot(xt,yt) syntax. Line color, specified as an RGB triplet, a hexadecimal color code, a color name, or a short name. For a custom color, specify an RGB triplet or a hexadecimal color code. Line width, specified as a positive value in points, where 1 point = 1/72 of an inch. If the line has markers, then the line width also affects the marker edges. Marker symbol, specified as one of the values in this table. By default, a line does not have markers. Add markers at selected points along the line by specifying a marker. Marker outline color, specified as 'auto', an RGB triplet, a hexadecimal color code, a color name, or a short name. The default value of 'auto' uses the same color as the Color property. Marker fill color, specified as 'auto', an RGB triplet, a hexadecimal color code, a color name, or a short name. The 'auto' value uses the same color as the MarkerEdgeColor property. Marker size, specified as a positive value in points, where 1 point = 1/72 of an inch. One or more function or parameterized function line objects, returned as a scalar or a vector. If you use the fplot(f) syntax or a variation of this syntax, then fplot returns function line objects. If you use the fplot(xt,yt) syntax or a variation of this syntax, then fplot returns parameterized line objects. You can use these objects to query and modify properties of a specific line. For a list of properties, see FunctionLine Properties and ParameterizedFunctionLine Properties. If fplot detects a finite number of discontinuities in f, then fplot expands the range to show them.